Steve Harvey and his team approached Bourn Creative to redesign the existing Act Like A Success website, giving it a professional facelift and laying the technical foundation for future membership site implementation. The site is built as a custom, responsive, HTML5, WordPress website powered by the Genesis Framework with retina support and schema.org integration. It includes a custom publishing system for simple management of complex page layouts, two custom plugins, custom page templates, and Infusionsoft form integration. The Courses section and Products section (shown below) of the website use a custom publishing interface that is made up of two custom plugins to manage both custom post types, and unique page templates for the individual sales pages and the archive pages. 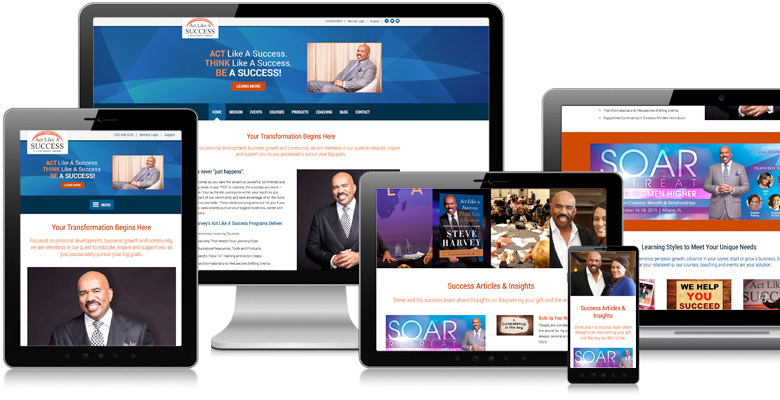 This publishing interface allows any member of the Steve Harvey marketing team to add an infinite number of courses or products to the site quickly and easily. All the client has to do is add the new course or product and upon save, the content is automatically formatted for them and automatically added to the main archive page available in the site navigation. All of the added courses and products can also be reordered at any time with drag and drop capabilities. New visitors or logged out visitors see the regular sales and marketing content, course and products overviews, and calls to action. Logged in members see special content available only to them, allowing them to quickly access the courses and products they have already purchased. To facilitate list building and email marketing growth, Bourn Creative built in conditional logic for the website sidebar to display email marketing opt-ins and calls to action in special feature widgets that can be added or removed on a per page or post basis. "The best part about this project is the automation built into the site. To create the complicated page layouts like those used on the Home, Courses, and Products pages, all the client has to do is add their content, then the styling and formatting is done automatically for them upon page save. This means any member of their team can add to and edit the pages quickly and easily."